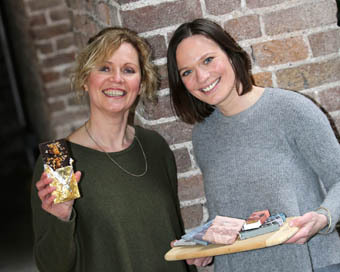 In the hot seat for March’s Women Who Launch are Karen and Natalie Keane from Bean and Goose. We are a chocolate brand inspired by Irish designers, food producers and other makers to create exciting and beautiful chocolate. We are Karen and Natalie Keane, sisters and chocolatiers. We make our chocolate at Last Tree Farm based in the Wexford countryside. At present, we employ one full time chocolatier and one part time production assistant. By the end of 2016 we plan to have four full time employees in the Bean and Goose team and have a production unit built on site. We finance our operations in several ways. Since we launched in 2014 we have had wholesale accounts, we are stocked in about 25 independent stores and spaces throughout Ireland and Northern Ireland. As a HPSUC and final participants on Food Works 2015 we have received feasibility funding from Enterprise Ireland. We have been awarded salary assistance from our local enterprise board in Wexford. We have also invested our own and family savings into our business. Our flavour profiles and branding have been developed for the new generation of consumer. A consumer that is searching for a meaningful experience, who seeks creativity and self-expression through their brands. Our consumer uses coffee, craft beers and other food groups to represent who they are. We are the first brand in Ireland that offers this story in a chocolate product. There are so many inspirational brands and companies on our own doorstep – we are a creative island. Naturally we love our partnership with Design Goat and Al Higgins. Ardbia, The Tweed Project, Loft Trading Co, Makers & Brothers, Wildflour Bakery, Tartine Bakery, Nobo, are just a handful of inspiring Irish companies out there. It’s hard to pick one. We have enjoyed so many lovely moments since we started Bean & Goose. Getting Design Goat on board and to have Al Higgins to do our photography is amazing. Being selected for Food Works 2015 and reaching the final stages was a massive achievement. Winning bronze in the Bank Of Ireland Startup Awards 2015 ‘Food Business’ category was fantastic as well. We have had a few of them! I think when a buyer just doesn’t get what we are doing and our approach. Also because we are in food and chocolatiers we have to fight against the portrayal of us as a ‘little hobby business’. Social Media is very important to us. We are a small company with a limited marketing budget and social media allows us to reach our audience in a cost effective way. We have very active Instagram, Facebook and Twitter accounts. Karen’s background is IT so we manage the social media ourselves. We use it as a forum to showcase what we create, tell the story of our brand and connect with our customers, retailers and fellow chocolatiers around the world. We are a handmade chocolate company and therefore do not use technology as such to create our products. However the ability to do so much online – banking, invoicing, accounts, creating documents, online courses and communication allows us to do a lot ourselves, which is critical for a small business in a remote location. We aspire to create a global Irish brand that can retain its integrity and roots whilst scaling up. As we grow, we would be mindful of emulating companies that have fantastic corporate culture. It is the key to help turn a company vision into reality. Companies like Zappos or Whole Foods have passionate, engaged, and active cultures that are on display for the world to see. We’d dire a team to help us achieve our goals; build a creative hub to allow us to experiment with design and chocolate; and launch a Bean and Goose flagship store in New York. It would have to be someone we could ask 101 questions and pick their brains. Maybe the legend that is Terrance Coran, he built a business based on food, product, design and lifestyle. He is a hard worker, loves what he does and paved the way in shaping how we live today. Eileen Gray should also be there, she was born in Enniscorthy and is only now getting the recognition she deserves. I think Terrance would like her to be there as well! We would have to be sensible and partner with a top-notch finance person. Ruth Porat the CFO of Google would be ideal!